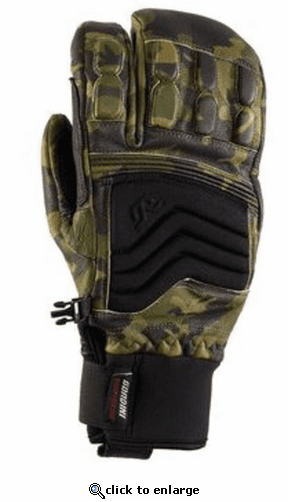 The New Gordini Wrangell 3 Finger Glove features Pittards camo goatskin with hi-denier durable fabric trim. Genuine goatskin palm, fingers and thumb with American bison leather reinforcement. With the best Primaloft insulation and Hydrowick microdenier lining, the Wrangell Camo features Primaloft, neoprene cuff with hook and loop closure, leash, wrap caps, palm and thumb reinforcement.